A day late, but hey, it's here. Pichu is a small ground-dwelling rodent. Its fur is very short, and it is pale yellow in color. The tips of its large ears are black, and it has additional black markings on its neck and tail. Its tail is short, but still bears some resemblance to the large lightning-bolt structure it will develop later on in life. It has pouches in its cheeks, which are pinkish colored and used for storing electricity. Its nose is extremely small, almost like a dot. Pichu, like its evolutions, is capable of producing electrical sparks from its cheeks, charging itself with electricity more easily on days with thunderclouds or when the air is very dry. However, since Pichu is only a baby, it cannot control them as well, and may release electricity unintentionally. Fortunately, it is not able to store large amounts of electricity in its body. 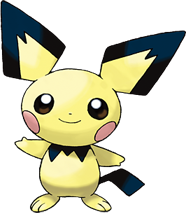 Pichu, and its evolution family, Pikachu and Raichu, are the only known Pokémon that can learn Volt Tackle.